Still underwater with the first week of school, so today we're printing emmett's great Folding Cube model from Thingiverse. The eight pieces print separately and then snap together with conical hinges to make an assembly that folds into two types of cubes, one with rounded corners and one with straight-cut corners. 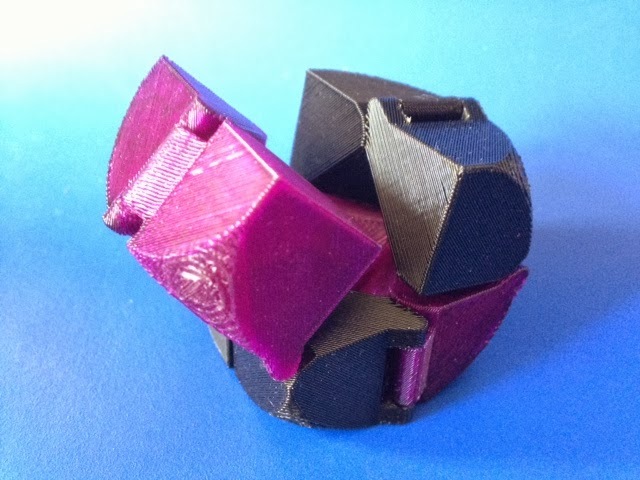 This type of folding cube is well-known but I think emmett is the first to design a 3D-printed version. It works wonderfully! Settings: MakerWare .2mm/Standard with no raft and no supports.